NOIA about their album, Maybe Forever. Ashley and Eduardo select their favourite songs from the record and tell me how they got together; what the music scene is like in Montréal is right now – they reveal touring plans and state whether a trip to the U.K. is a possibility. The guys tell me about their D.I.Y. approach to music and what equipment they used to record Maybe Forever; if they get time to escape away from music; some new acts we need to get our ears around – they end the song by selecting some fine cuts. Hi! It’s been great! We just played a really fun outdoor show and the day before we were interviewed by a local radio. Other than that; we've been enjoying the summer here in Montreal! 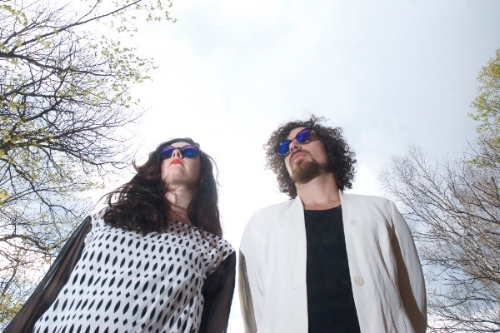 To quote our bio: “Part dance-rock, part electro-pop, Montreal indie duo NOIA is the fruit of the creative collusion between musicians Ashley Long and Eduardo Noya Schreus”. Your L.P., Maybe Forever, is out. Are there particular themes that define the album? What was it like recording it? For this specific album, there are no themes in particular that could be singled out. In terms of recording the album, it was a fun/hard and interesting process that took place over quite a few winter months. The vocal/guitar/bass recordings took about a week; then we spent another week in Miami mixing with our friend Reuven Amiel. Do you each have favourite cuts from the record? Ashley: A tie between Too Much Attention and Ding Ding. I believe the album was a D.I.Y.-made thing where you took care of every stage. Can you describe the sort of equipment and spaces that brought the songs to life? Both were crucial for the inspiration on this album. We started using hardware because Ed was feeling more and more turned off with D.A.W.s (digital audio workstations.) Our hardware consists of a sampler, a drum machine and three synths. The touch of real equipment and the learning process that accompanied it refreshed everything. The other 50% was getting a jam space, which allowed us to play very loud and actually feel the sound vibrations better. To be standing up while creating makes a big difference in contrast to making music sitting down in front of a computer. We loved it so much that we began going every day! Even when other bands were scheduled, we would wait and go late at night. How did NOIA get together? Ashley and Eduardo. When did you meet one another? We had a mutual friend from whom Eduardo adopted a cat, the wonderful El Niño. Ed mentioned he was interested in finding a female vocalist to go in a new direction with his project, which was solely instrumental at the time. She recommended me (Ashley) and it all took off from there. He contacted me and I immediately liked him and his music. We instantly clicked, played one of our first shows at Rojo Nova - a cultural festival in São Paulo, Brazil - and the rest is history! Is Montreal a great area for creating music and finding influence? Montreal is definitely an awesome place to make music. Finding influence is a bit harder when you want to broaden your scope because scenes are quite insular here but, if you really make the effort, you can find so many different kinds of music in this city. We are actually going to start working on that very soon. We were very busy wrapping up everything for the release of this album: our first album! Ed has been focused on scoring music for a couple of French T.V. series (Versailles and Philharmonia), so we’ll hopefully get out on the road once he’s all wrapped up! Might you head to the U.K. and play this year? That would be amazing, especially since we have often been told that our music would fit well in the European music scene. We’ll let you know as soon as we confirm any U.K. shows. Can’t wait to play there in the near-future! We’re working on writing and recording our next album which we hope to have ready for release later this year - and we’d like to play as many shows as possible because it’s so much fun! Eduardo: My friend Michael Lucas, an amazing drummer who currently plays in a Berlin-based band called Rabia Sorda, among others; Peruvian ceviche and San Pedro cactus. Ashley: ALL OF MY AMAZING MUSICIAN FRIENDS! Popcorn and mango lassi. Believe in yourself! Never forget that it’s all about having fun AND mainly be genuine: don’t emulate anybody else’s music. Our friends Gabriel Vigliensoni, Colin Jenkins; Dengue Dengue Dengue and, if you like video stuff, Justine Durand and Max Hattler. We do not unwind from music: Ed works on music scores during the day and we jam normally at night. Ashley is studying illustration among other things. In our free time, we love camping, travelling; bike trips, surfing and skateboarding!